I didn’t start thinking critically about gender until college. There, I was introduced bell hooks, Audre Lorde, Leslie Feinberg, and Judith Butler. I started to unpack and unlearn, to disrupt and expand my worldviews. I began to understand the importance of naming ourselves on our own terms, and claimed the word queer. It was incredibly empowering to have this new level of access to ideas and identities, but I struggled finding language to articulate my gender. I spent hours face to face with my mirror trying to see something in me that I could put to words, and the only thing that would ever come up is “not a woman.” That feeling stayed with me for years; “not a woman” is still is one of the only things I can say with certainty about my gender, though now I also understand my identity as trans. So why would I sell my pottery at Womencrafts? I have a complicated relationship with women’s spaces. I went to a women’s college. For almost a decade I played on a softball team in a women’s league. I am a gestational parent, and mom groups are the only local places that offer support for the postpartum experience. As an adult, these highly gendered spaces have been my main sources of community. I have experienced them as deeply feminist, deeply political, and in constant interrogation of who belongs. It is a specific kind of challenge to be rooted in community that continuously questions whether you are allowed in. And I do this questioning myself, reflecting on what it means to take up this space, both in terms of my own privilege and invisibility. But I’m here. 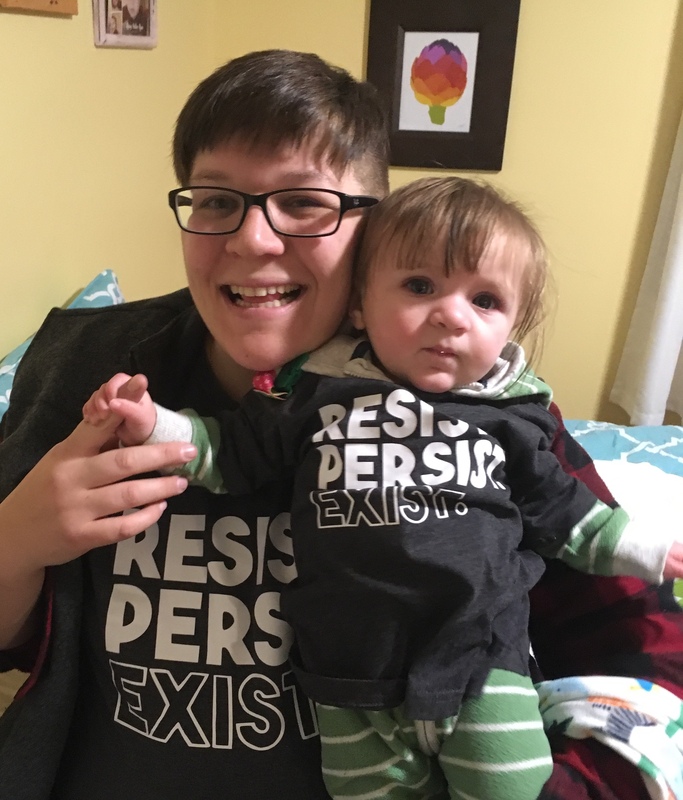 Even though I’m not a woman, queer and feminist women’s spaces are often the closest reflection of who I am, and are very much where I come from. Understandings of gender are shifting. The evolution of spaces like Womencrafts are central to this discourse. I want to be part of the conversation. My pottery is another way to give voice and visibility. 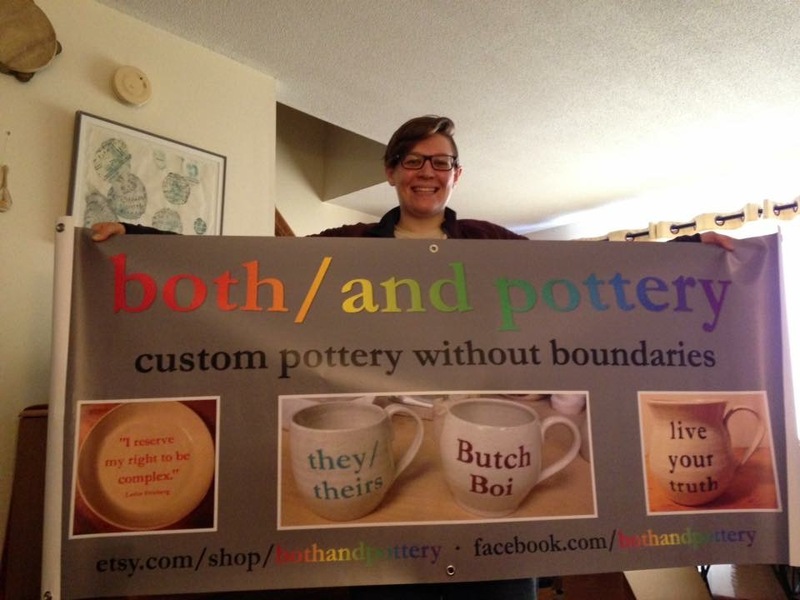 I named my business both/and pottery, which to me speaks to the blurred boundaries and ambiguities that many folks navigate in their identities. I make utilitarian stoneware out of a white, speckled clay, underglazed with words and images that embody LGBTQ+ identities as well as broader social justice and queer communities. I try to represent more than just mainstream LGBTQ identities through my work. Some of my favorite mugs have read: ace, hard femme, stud, so gay, gender fluid, they/them, and butch boi. It gives me a lot of pleasure to see people react with joy to finding a mug that names an aspect of their identity/experience. As a word and book lover, it makes me particularly excited to see my pottery displayed amongst books about gender, sexuality, and feminism at Womencrafts. While selling my work at this shop is not a decision I take lightly, I feel proud of the discourse and evolution my pottery and I are a part of here.